Montana took down San Diego for a nice road victory on Sunday, but the biggest story for them was the return of big man Derek Selvig. 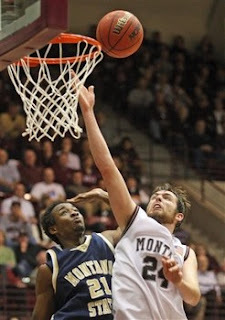 In Montana's 73-60 victory, Selvig did not start, but he played 23 minutes, scoring 8 points and grabbing 6 rebounds. Selvig opened things up a bit for the Griz, who had their best offensive output of the season. Montana shot a sizzling 60% from the field. Kareem Jamar was the high scorer with 14, including 4/4 from beyond the arc. He also had 5 assists and 5 rebounds. They also got 13 points from Will Cherry, but he did turn the ball over 7 times. The big key was contributions from the big men. Billy Reader had the best game of his young career, with 11 points and 4 rebounds. Mathias Ward contributed 10 points as well. If Montana can consistently get efforts like that from the big men, they are a serious threat to Weber State. Suddenly, the 1 point victory over Great Falls is forgotten, and the Griz are looking like one of the top 2 teams in the Big Sky again. Elsewhere in the Big Sky, Northern Colorado gave a nice effort, losing 78-69 against Northern Iowa, but it just wasn't enough. The star of the game for the Bears was guard Paul Garnica, who finished with a career high 22 points. He also had 3 rebounds, 2 assists, and 2 steals. Garnica shot 6/9 from downtown, and is slowly morphing into their go-to guy. Tate Unruh was the only other guy in double figures, as he had 12 points. The Bears were undone by their 25 turnovers, as well as lack of production up front. Five Panthers scored in double figures.